Morning surfers and beach walkers were still arriving at Florencia Bay, on the west coast of Vancouver Island, when staff from Pacific Rim National Park Reserve showed up and politely—this is Canada, after all—asked them to leave. When the coast was clear, literally, Parks Canada sentries also blocked off each public access point. Then a two-person team was stationed midway down the bay—which is long and beautiful and curves back on itself at each end, like the razor clam shells scattered on the sand—with 12-gauge shotguns. They were waiting for a wolf. They didn’t have to wait long. The wolf, a large, tawny male, emerged from the forest around noon, recognizable at a distance by the ruff of black fur that framed his face. Perhaps sensing the lurking human presence, he ducked back into the forest, just like any normal wolf should. An afternoon passed, probably the quietest that Flo Bay, as the locals call it, had witnessed in a long time. It was May 28, and ordinarily would have been a fine day to spend on the coast of British Columbia: sunny, warm, with a light breeze coming off the Pacific. But this day, two resource management officers, members of the park’s conservation staff, were keeping a grim watch. At last the black-faced wolf reappeared. By then it was dusk, the sun declining toward the broken tip of Quisitis Point to the northwest. The animal had circled behind the officers, where it quickly picked up their tracks on the beach. Then it started to move toward them—and there was nothing normal about that at all. Two months earlier, I had joined Todd Windle, Pacific Rim’s human-wildlife conflict specialist, for a walk in wolf country. As we prepared to set out, he armed himself with pepper spray—“like putting your seat belt on, like putting your bike helmet on”—and dropped various noisemakers into his pockets. “If we see wolves, we are actively going to try to scare them away,” he said. Back in November 2016, Parks Canada had issued a bulletin warning of “bold behavior” by wolves, including one that faced off with a runner and his two dogs until police sirens from the man’s 911 call finally scared the animal away. Similar incidents had played out sporadically ever since, and park staff were increasingly concerned that some Pacific Rim wolves had been given food by visitors. The most recent encounters had occurred not far from where Windle and I stood; one involved a wolf that approached a park employee even after a close-range blast from an air horn. Windle led me first to two wildlife trail cameras, each sensitive enough to be triggered by the body heat of even a bird. Yet when Windle scrolled through the photos, which spanned the late winter, most of the wildlife wasn’t wild at all. “Dog. Dog. Dog. Dog. Two dogs,” said Windle, winding back through the months. Each hound and labradoodle was accompanied by its human, of course. Suddenly: a wolf. The way it radiated sensory awareness, even in a photograph, brought the sheer obliviousness of all the people and pets into sharper relief. Then it was back to dogs and humans, humans and dogs. Fresh-faced, chestnut-bearded and every bit the kid who has grown up to do “the coolest job in the world,” Windle is fond of quoting the American ecologist Aldo Leopold: “Wildlife management is comparatively easy; human management difficult.” Pacific Rim may be a rain-soaked tangle of forest, sand, and stone holding its own against the sea, but the park’s core, known as the Long Beach Unit, is just 25 kilometers long as the gull flies, and sees a million visitors a year. Immediately north of the protected area is Tofino, an earthy tourist town that still likes to pretend that it doesn’t need traffic lights; to the south is the hamlet of Ucluelet, 10 years behind its northern neighbor, but quickly playing catch-up. For decades, there were no wolves here. Vancouver Island, the largest island on the west coast of North America, once had a genetically distinct wolf population, but it was wiped out during a series of government-sponsored extermination campaigns in the early 20th century. 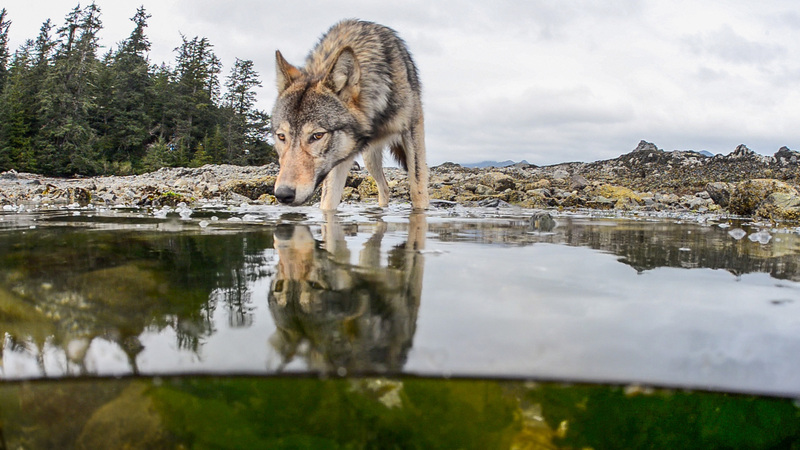 Wolves were also eradicated from coastal California, Oregon, and Washington, yet enough animals endured on British Columbia’s mainland to swim across and attempt to recolonize the island. Again and again, they were killed off. Only in the 1970s did they begin to survive long enough to reclaim the island. Vancouver Island’s wolves are a variety of gray wolf, Canis lupus, known as coastal wolves or sea wolves. Smaller than most gray wolves (though a large male may still weigh 40 kilograms, about the size of an Alaskan malamute), they have shorter, coarser coats that often have reddish or golden tones as well as shades of white, black, and gray. In other places, gray wolves hunt mainly ungulates such as moose, elk, and deer, but coastal wolves also eat from the sea: waterfowl, otters, shellfish, even seals and sea lions. They fish skillfully for salmon. Until recently, the planet’s surviving wolves were so closely associated with remote and wild places that they were preeminent symbols of wilderness. Yet by the time wolves made their Vancouver Island comeback in the 1970s, it was unavoidable that they would be sharing their habitat with humans. The island’s population was rising toward half a million (it’s close to 800,000 today), with most residents crowded along the shorelines. The coastal wolves moved onto an island of coastal people. There were other pressures, too. Pacific Rim park, founded in 1970, awakened the world, and even many British Columbians, to the rugged, mist-breathing beauty of Vancouver Island’s temperate rainforests. Today, the island is spangled with protected areas busy with fishers, sea kayakers, beachcombers, clam diggers, surfers, gunkholing sailors. At the same time, logging companies were rapidly felling unprotected old-growth forests, where a tree might be more than 1,000 years old and stand 20 stories tall. Each cleared area offered 15 to 20 years of good forage for deer as new growth filled in, and then decades in which dense stands of maturing trees choked out vegetation on the forest floor. As more and more of the island reached the latter stage (what scientists call ungulate barrens), deer were starved out of the forests to crowd along shorelines and roadsides, and—as many an angry coastal gardener will tell you—into rural yards and even towns themselves. We built what author Al Cambronne calls Deerland, and they came. The wolves followed. 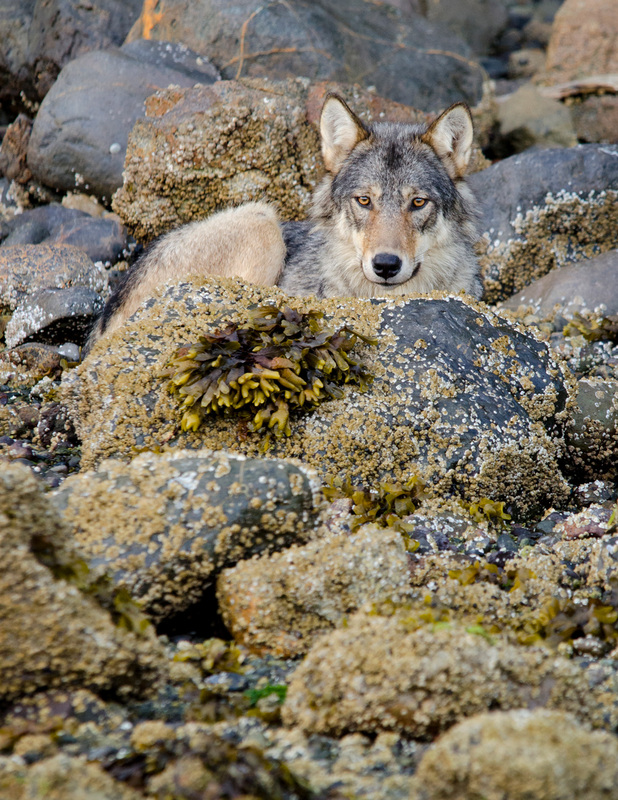 Still, for a quarter century after they began to resettle Vancouver Island, wolves remained ghosts on the landscape. In Pacific Rim park, wolf sightings were recorded perhaps a half-dozen times up to 1997. That summer, a woman reported that two wolves escorted her for nearly half an hour during a twilight beach walk, approaching as close as the width of a neighborhood street. The encounter was an oddity, an outlier. That era has a name: the Anthropocene, or Human Age, a new geological epoch that leading scientists argue began around 1950. Its signature is the dominance of human influence on the planet’s systems, from global climate change, to deforestation, to the rise of the chicken as the world’s most numerous bird. Every species, maybe even every individual living thing, now has its Anthropocene story. The relationship between wolves and dogs is complex: wolves can seem curious about them as canine cousins, or attack them as territorial invaders. In Pacific Rim, they have mainly hunted them, or, as Windle delicately put it, “They target them as a prey item and consume or partially consume them.” In every case that he was aware of, the attacks had been made on dogs that were off their leashes. Running free, dogs lose the protection of humans, and are exposed to a fierce, intelligent predator that can easily dispatch breeds like pit bulls and German shepherds. “The leash is really that lifeline for your dog. But it’s a tough message, because who wouldn’t want their dog running around, having a good time?” Windle said. It’s illegal to let dogs run off leash in Pacific Rim park. It’s also common. Ten percent of visitors to the park bring dogs, and surveys have found that about 50 percent of those dogs will run free. That’s 50,000 off-leash dogs on the park’s beaches and trails each year. To the casual reader of daily news, a wolf attack, whether on a dog or a human, is a bolt out of the blue—evidence of nature red in tooth and claw. To Pacific Rim staff, such incidents are almost invariably the culmination of a process. Consider, for example, the only known wolf attack on a person in the Pacific Rim region, which took place in July 2000. The attack happened outside the park, on Vargas Island, a popular destination for outdoor enthusiasts. For more than a year, rumors had circulated that visitors to the island were feeding wolves, including pups. In the parlance of human-wildlife conflict, the wolves were becoming habituated, meaning they were losing their natural wariness of humans, as well as food conditioned, meaning they had learned that they could scavenge our litter, raid our supplies, or even, as on Vargas Island, be offered treats. “They had been hand-fed pieces of a whale carcass that was sitting there,” Windle told me, recalling one of the more disconcerting reports. In the weeks leading up to the attack, at least four serious encounters occurred between people and aggressive, fearless, or food-seeking wolves in the area. Finally, on July 2, 2000, a kayaker sleeping under the stars awoke in the night to find a wolf sitting on the end of his sleeping bag. Another camper scared it away, but it returned, this time pulling on the sleeping bag with its teeth. When the kayaker began shouting and fending off the wolf, it attacked—whether out of raw aggression or as a defensive response, no one can say. By the time the wolf was chased away again, the man had bite wounds to his back, hands, and head. It took 50 stitches to close the cuts on his scalp. The following morning, conservation officers killed two wolves on Vargas Island. If they had been humans, we would have said that they were “known to the authorities”—they were the food-conditioned pups, all grown up. 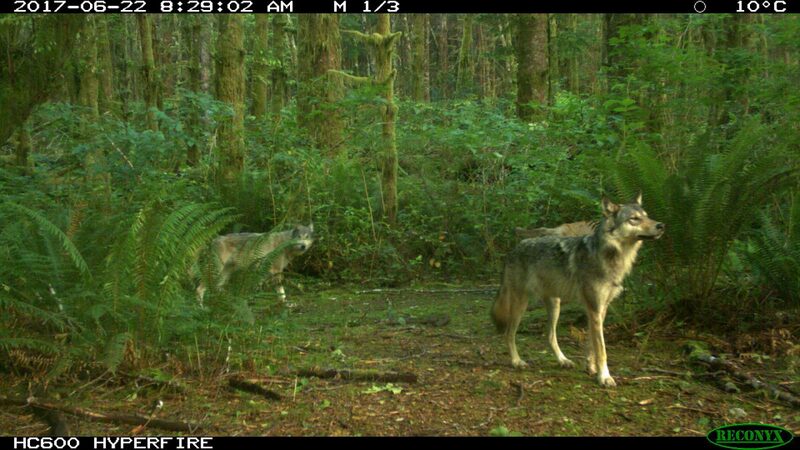 When wolves returned to Vancouver Island in the 1970s, they didn’t just find a different landscape—the people, too, were changing. The older settlers, prone to shoot wolves on sight, were giving way to a new breed of human that not only didn’t fear wolves, but actively wanted to interact with them. Around Pacific Rim today, stories abound of people who tried to lure wolves into their basements with dog food, or approached wolves to take selfies. Windle showed me a photo taken by a park visitor who had gotten so close to a wolf that the animal is looking up into the camera’s lens. The strategy for peaceful coexistence with wolves seems straightforward. Keep a clean camp. Never ever feed wolves, or leave food accessible to them. Avoid hiking alone, and at dawn, dusk, and after nightfall. Keep your children close and your dog on a leash. Similar rules, focused on food storage and garbage management, radically reduced conflicts between humans and bears 20 years ago. Many visitors follow these guidelines for wolf coexistence, but more than enough do not. Toughest of all for people to accept is that they should frighten away any wolves they see, at any distance: “Scare, don’t stare,” is a phrase coined by the mayor of Ucluelet. Instead, deluded by forces ranging from Disney to wildlife documentaries, from spiritualism to social media, many believe that getting close to wild animals is just another way of living life to the fullest. He stopped cold: he had found wolf tracks, fresh ones. Even to my untrained eye, they were easy to distinguish from dog prints, not so much for their large size (though some nearly match the span of my hand), as their greater sense of purpose—the straight-line efficiency of an animal going about the daily business of survival. We followed the tracks for only a few paces before they were overlaid with boot and dog prints. When we emerged onto a beach, I promptly counted 20 people on foot, plus seven surfers and a dog. A quiet, shoulder-season day. Windle took in the scene. Three days later, in this same spot, a wolf attacked a Jack Russell terrier, which walked away with only a broken jaw after its owner and several other people drove the animal off. Nonetheless, the incident took a dubious place in the record books: it was the first known attack by a wolf on a leashed dog in Pacific Rim’s history. The wolf in question was described as a large male with a black face. Two months passed. Then, on May 14, just two weeks before a pair of resource management officers would be deployed there with 12-gauge shotguns, a young woman named Levana Mastrangelo walked down Florencia Bay beach to check another wildlife camera. Mastrangelo had placed the camera as part of a geography field course she was taking, choosing the mouth of Lost Shoe Creek, where water spills out of the rainforest to rush across the sand, as her site. On an earlier visit, she had felt a powerful, unseen presence there. Now she was convinced there would be no wildlife photographs on it. Spring weather was bringing more beachgoers to the bay every day, and the creek mouth is a popular hangout. Mastrangelo removed the camera, and then, joined by three other students, sat down to load the photos onto her laptop. Then she happened to glance across the stream and saw a living, breathing wolf. Mastrangelo was more inclined to think deeply about the encounter than most of us might be. Her mother had been born into the Yuułuʔiłʔatḥ, or Ucluelet First Nation, whose traditional territory includes the southern half of Pacific Rim National Park Reserve, but as a child had been removed and placed in Canada’s infamous residential school system, a program of forced assimilation for indigenous people. Only in the past three years, as a university student, had Mastrangelo begun to reconnect with her Yuułuʔiłʔatḥ roots. Working as a researcher for the Yuułuʔiłʔatḥ government, and later as its lands and resources coordinator, Mastrangelo had learned that her family came from Quisitis Point. She also learned that wolves are sacred to the Yuułuʔiłʔatḥ. In fact, they are the central figures in one of the world’s most extraordinary cultural rites. Anthropologists have compared the Tlo:kwa:na, or Wolf Ritual, to similarly epic indigenous ceremonies around North America, such as the Hopi Snake Dance and Sioux Sun Dance. Performed by various indigenous communities on Vancouver Island and the Washington coast, the ritual can last 10 days or more. In it, people take on the role of wolves in order to capture young people for initiation into important cultural practices. “In our traditions, we don’t kill wolves,” said Mastrangelo, who now represents the Yuułuʔiłʔatḥ in ongoing talks about wolves with Parks Canada and other governing bodies in the area. Written records from the early 1900s describe the rite’s importance to the Yuułuʔiłʔatḥ town of Hitacu, just across a narrow inlet from the broader community of Ucluelet. In those days, Hitacu’s relationship with wolves was so close that Tlo:kwa:na initiates, howling as a part of the ceremony, might be joined by a chorus of living wolves in the nighttime forest, and incorrect performance of the rite—even singing the wrong words to a song—was said to cause wolf attacks. It’s a tradition, Mastrangelo said, that asks us to look first at human behavior when wolves’ behavior changes. From the perspective of Tlo:kwa:na, human-wolf conflict is a message to think harder about human-wolf coexistence. British Columbia is crosshatched with mountain ranges, grasslands, forests, and inlets, and its natural richness is mirrored in a remarkable array of First Nations—198 of them, or about one-third of Canada’s indigenous cultural diversity. 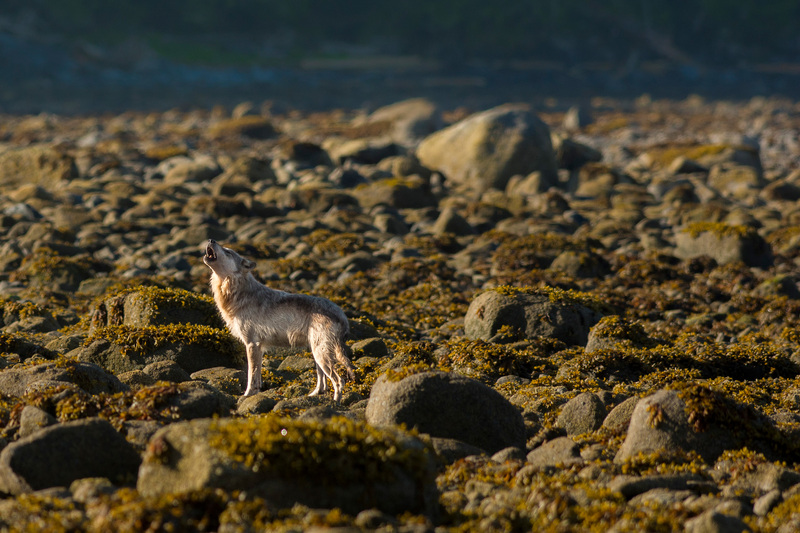 Prior to contact with European explorers, as many as 300,000 indigenous peoples lived on the narrow strip of British Columbia’s coast—and yet wolves were present nearly everywhere, as remembered in stories, art, and names. Dogs were common, too. 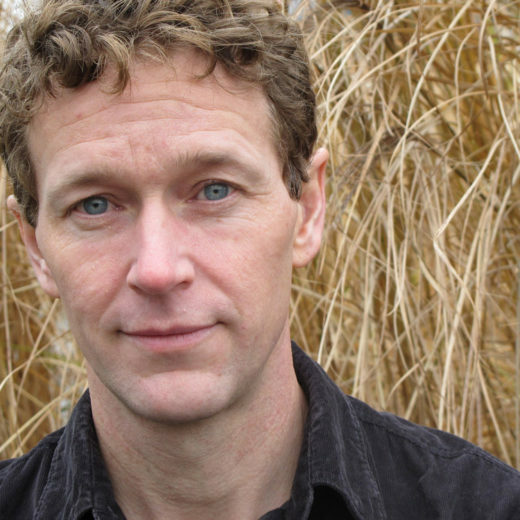 According to Iain McKechnie, an archaeologist with the University of Victoria and the Hakai Institute, dog bones are abundant and widespread in coastal archaeological sites from Oregon to Alaska and reach back to the last ice age. Historical records suggest that in southwestern British Columbia and western Washington, where Coast Salish peoples kept two breeds of dog, including one that was shorn for its wool, some communities likely were home to upward of 100 dogs. For thousands of years, people, dogs, and wolves all shared the same landscape. As Mastrangelo contemplated her encounter with the wolf at Lost Shoe Creek, she found more and more meaning in the wolves’ behavior in Pacific Rim. She realized, for example, that November was the traditional season of the Wolf Ritual, and it had been November when Parks Canada issued its warning about “bold behavior” by wolves, which led into months of human-wolf conflict. On May 28, the two resource management officers were waiting on Florencia Bay. They had chosen to position themselves just south of where Lost Shoe Creek spills onto the sand. That morning, a wolf had attacked a golden retriever as it was being walked by an American woman—the park’s second attack by a wolf on a leashed dog. 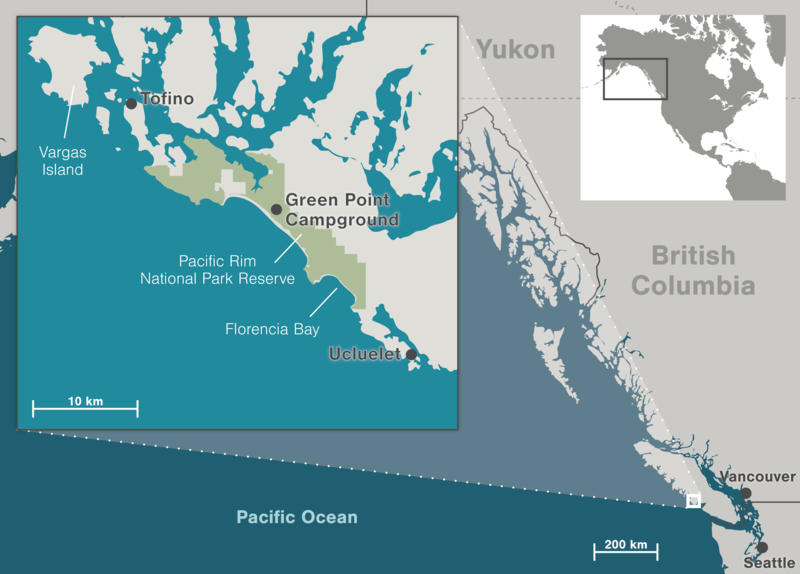 The attack took place on the beach below the Green Point Campground, one of Pacific Rim’s busiest locations, with nearly 120 campsites. In the midst of the melee, the woman had fallen, then kicked at the wolf from the ground. She was not bitten, but no one can say how the fight would have ended had her screams not brought other campers rushing to her aid. Once again, the wolf involved was a large male with a black face—a wolf with a history. He had been seen heading south, toward Flo Bay. Parks Canada doesn’t reveal the names of staff who kill wolves in such circumstances. It is an unpleasant, last-resort act, and many people are typically involved in the decision. “All the wildlife experts across the country said, well, if it had been ours, we would move to removing that one from the population,” Renee Wissink, manager of resource conservation for Pacific Rim, told me. When the wolf was shot, he was less than six meters away from the Parks Canada team, and still closing in. Trotting up like a dog that’s hoping for a treat. He died from a single lead slug to the chest. The wolf’s body went first to a government wildlife veterinarian, who found that the animal was thin, probably because he had been recovering from a small puncture wound to his abdomen, but otherwise healthy. The carcass was then turned over to the two indigenous nations, Yuułuʔiłʔatḥ and Tla-o-qui-aht, on whose territories the wolf lived and died. Having decided that it was important to return the wolf to his home range so his pack would know what had happened (wolves mourn as surely as dogs do), the nations buried him in an undisclosed location far up Lost Shoe Creek. Here lies one rogue wolf. But that is not the end of the story. 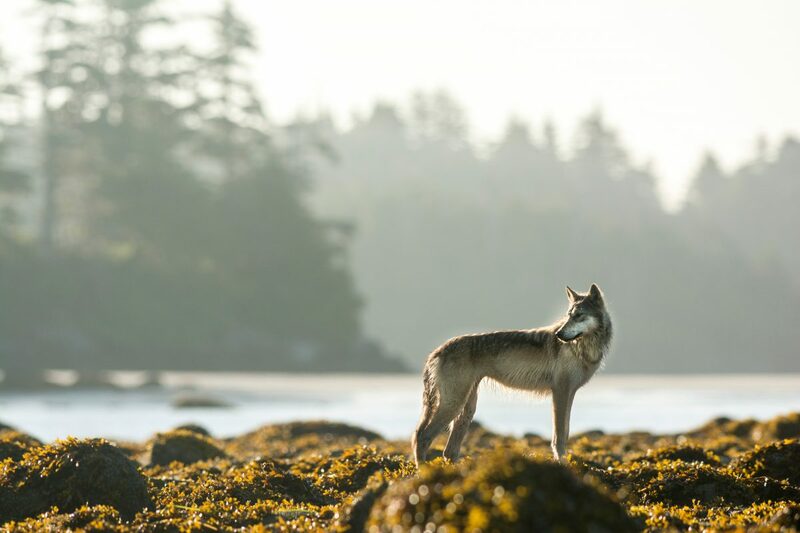 In the wake of the wolf’s killing, a committee made up of representatives from Parks Canada, the First Nations, and the towns of Tofino and Ucluelet has been discussing the need for a united front on coexistence with wolves, which move freely between jurisdictions. Parks Canada is preparing to carry out better research on the wolf population, and, with a stronger visitor education campaign, managed to reduce the number of dogs that were off leash this past summer from half to one-third. The Yuułuʔiłʔatḥ will study whether to close the Lost Shoe Creek drainage to visitors; the Tla-o-qui-aht are considering zip lines that dogs could be leashed to as an alternative to free-running dogs in their communities. One potential solution—banning dogs from the park—is controversial, but far from unprecedented. Pets are almost entirely forbidden from the wild landscape across much of the United States national park system, including in Yellowstone National Park, famous for both wolves and crowds of tourists. Olympic National Park in Washington State, which protects a landscape much like Pacific Rim’s, prohibits dogs along most of its shoreline. Yet Mastrangelo argues that the wolves are asking for a much deeper engagement. “The problem with the wolves is so many other problems—they’re telling us there’s something way bigger, there’s way more than just the dogs,” she said. But we also welcomed back the wolf as a symbol. In my conversations about human-wolf coexistence, one image came up again and again: a vision of the wolf as we want it to be, utterly wild, wholly independent, vanishing into fog or forest at the first hint of human presence. It might be too much to hope for. It might be too much to ask of the modern wolf, the Anthropocene wolf—an animal that feels human influence in everything from its habits to its habitat. I saw a humbler ideal in the images captured by wildlife cameras. I had been told about one cam in particular, hidden in a spot that can fairly be described as within the town of Tofino. I found it, camouflaged and strapped to a tree, just steps away from a cluster of homes, maybe 100 paces from a shortcut that children might take to school. And yet, earlier that day, I had looked at dozens of photographs taken at this location: lots of people and dogs, yes, but also wolves, by day and night, coming and going, often utterly unnoticed except by the camera’s mechanical eye. They weren’t images of an unwild world and a wild one. They were visions of two solitudes, sharing the world as it is. Cite this Article: J. 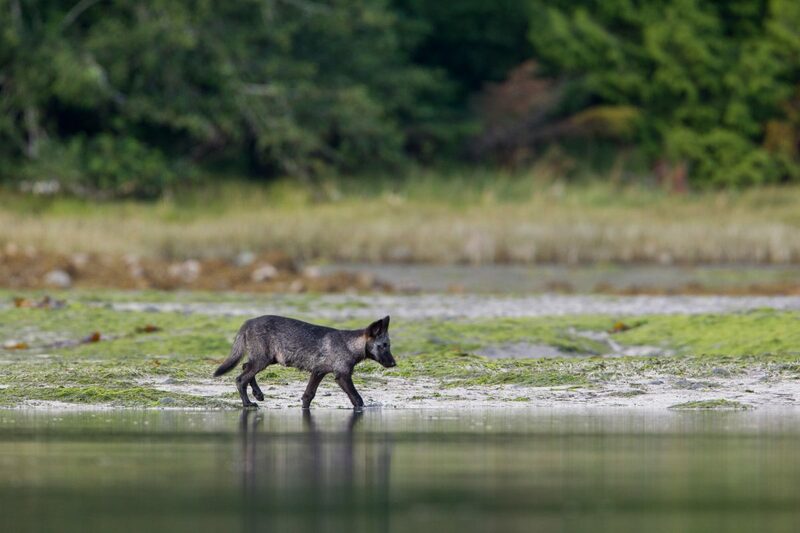 B. MacKinnon “Death of a Modern Wolf,” Hakai Magazine, Oct 17, 2017, accessed April 26th, 2019, https://www.hakaimagazine.com/features/death-modern-wolf/.